We may never know who the Mona Lisa was or what she’s smiling about, but we do have some idea of how Da Vinci created the sombre mood and smoky colors that add to her allure. Leonardo da Vinci would first create a detailed underpainting in a neutral gray or brown, then apply his colors in transparent glazes on top. Some of the underpainting would show through the layers, subtly helping to create form. On his palette were muted, earthy browns, greens, and blues within a narrow tonal range. This helped give a sense of unity to the elements in the painting. No intense colors or contrasts for him, so no bright red for Mona Lisa’s lips nor blue for her eyes (though it doesn't explain why she hasn't got eyebrows!). 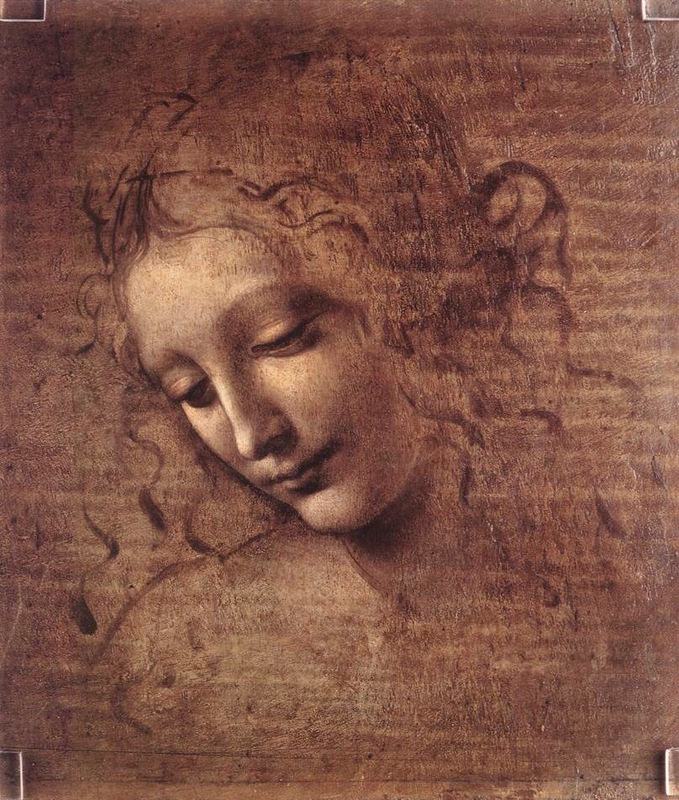 Soft, gentle lighting was crucial to Da Vinci's paintings: “You should make your portrait at the hour of the fall of the evening when it is cloudy or misty, for the light then is perfect.” Facial features were not strongly defined or outlined, but conveyed by soft, blended variations in tone and color. The further from the focus point of the painting, the darker and more monochromatic the shadows become. 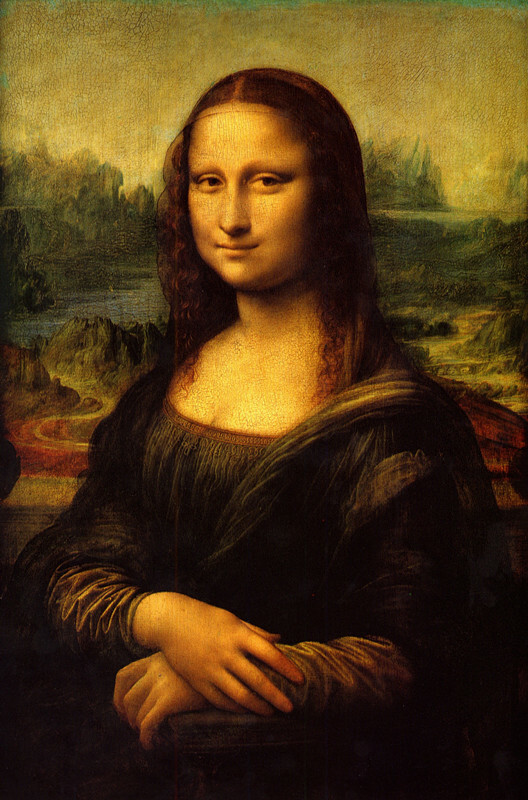 Da Vinci’s painting techniques of softening colors and edges with dark glazes is known as sfumato, from the Italian fumo, meaning smoke. It’s as if all the edges have been obscured by a haze of transparent shadows, or smoke. Creating colors by applying glazes gives a painting a depth you cannot get by applying a color mixed on a palette. Or in his own words: “When a transparent color lies over another color differing from it, a compound color is composed which differs from each of the simple colors”. Leonardo Da Vinci (April 15, 1452 – May 2, 1519) was an Italian Renaissance polymath: painter, sculptor, architect, musician, mathematician, engineer, inventor, anatomist, geologist, cartographer, botanist, and writer. His genius, perhaps more than that of any other figure, epitomized the Renaissance humanist ideal. Leonardo has often been described as the archetype of the Renaissance Man, a man of "unquenchable curiosity" and "feverishly inventive imagination". He is widely considered to be one of the greatest painters of all time and perhaps the most diversely talented person ever to have lived. According to art historian Helen Gardner, the scope and depth of his interests were without precedent and "his mind and personality seem to us superhuman, the man himself mysterious and remote". Marco Rosci states that while there is much speculation about Leonardo, his vision of the world is essentially logical rather than mysterious, and that the empirical methods he employed were unusual for his time. Leonardo was, and is, renowned primarily as a painter. Among his works, the Mona Lisa is the most famous and most parodied portrait and The Last Supper the most reproduced religious painting of all time, with their fame approached only by Michelangelo's The Creation of Adam. Leonardo's drawing of the Vitruvian Man is also regarded as a cultural icon, being reproduced on items as varied as the euro coin, textbooks, and T-shirts. Perhaps fifteen of his paintings have survived, the small number because of his constant, and frequently disastrous, experimentation with new techniques, and his chronic procrastination. Nevertheless, these few works, together with his notebooks, which contain drawings, scientific diagrams, and his thoughts on the nature of painting, compose a contribution to later generations of artists rivalled only by that of his contemporary, Michelangelo. Leonardo is revered for his technological ingenuity. He conceptualised flying machines, a tank, concentrated solar power, an adding machine, and the double hull, also outlining a rudimentary theory of plate tectonics. Relatively few of his designs were constructed or were even feasible during his lifetime, but some of his smaller inventions, such as an automated bobbin winder and a machine for testing the tensile strength of wire, entered the world of manufacturing unheralded. He made important discoveries in anatomy, civil engineering, optics, and hydrodynamics, but he did not publish his findings and they had no direct influence on later science.